The RNBT’s poster veteran, Vic Read made a special impromptu visit to RNBT. It was a lovely surprise to meet the man who has been the face of the RNBT posters for over 7 years. Vic Read traveled from Bognor Regis by public transport especially to meet Corinne, the Events and Publicity Officer. It was many years ago that Corinne saw a photo of Vic, taken at the National Arboretum and thought it would be a great one to use for the RNBT advert poster. Vic now 96 years of age, joined the Royal Navy in January 1939 in the Fleet Air Arm and served for 15 years, leaving as a CPO Air (L). 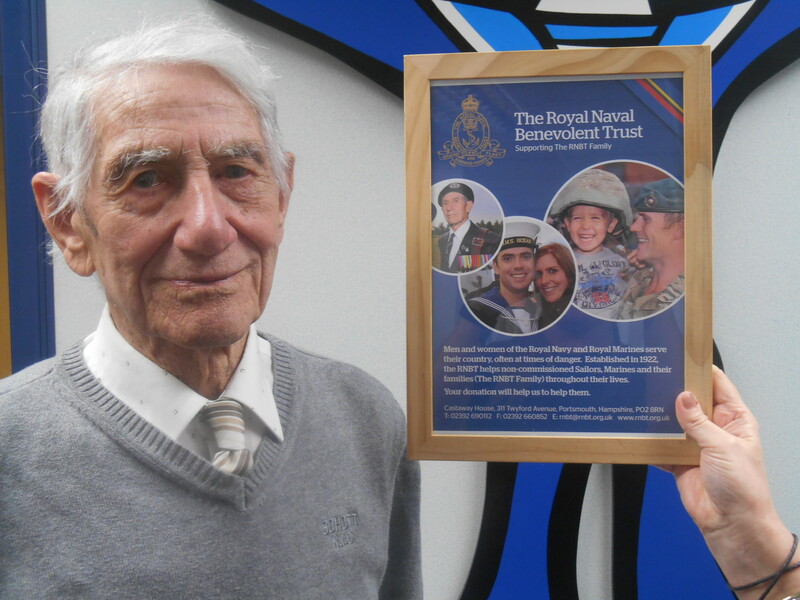 Vic has always been an active member of the RNA and was the Standard Bearer for his local RNA. He now lives in Brigg, Scunthorpe and decided that whilst he was on holiday in Bognor he’d visit RNBT.